This past weekend was the Babydolls birthday and we did a slumber party. It was six girls (five guest plus the guest of honor) and a really late night. This had to be the easiest party ever!!! The menu was very basic (personal pizzas, sour cream & cheddar chips, fruit – they had cantaloupe, strawberries, watermelon & mango and a Jell-O poke cake for dessert) and it was such a relief. Having said that, I didn’t do a family dessert until Monday. I was going through some magazines last week and saw a comparison of carrot cakes (a healthy vs. traditional version) that had me intrigued. It also made me want to have carrot cake for dessert really soon. 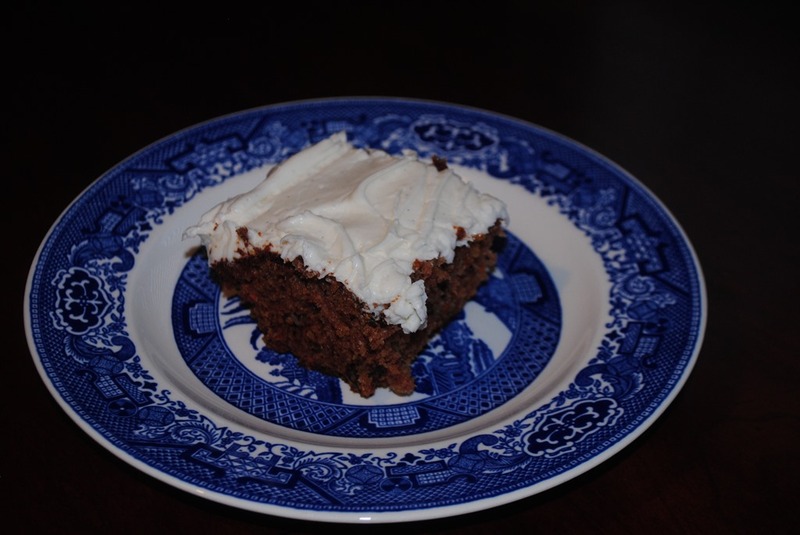 The healthy version of the carrot cake cut the sugar and oil in half and whole wheat flour was used along with all-purpose flour. For me, anytime you tell me you want to cut out the fat in a cake, you kind-of lose me. I never, ever, ever want a cake to be dry and when you reduce fat you run the chance of having a dry cake (and that was mentioned as one of the comments for that recipe.) I still wanted to try a healthier recipe so I set around and thought. I decided upon applesauce as that is something that is used often in recipes as a fat substitute. Plus the applesauce might also add some flavor to the cake. I also did a mixture of all-purpose flour and cake flour instead of using only all-purpose flour. I felt this would help to make for a lighter cake. I shifted the flours and spices twice before making the cake. My goal the entire time was to have a light and flavorful cake. For the icing, I decided to cut the cream cheese and powdered sugar in half and added a 8 oz. jar of marshmallow fluff. It remained light and still really good. I have to say that the end result was very tasty. It was not as moist as my original recipe but not at all what I would consider dry. If you want to have a good carrot cake that does not have much fat and sugar as the traditional recipe, give this one a try. 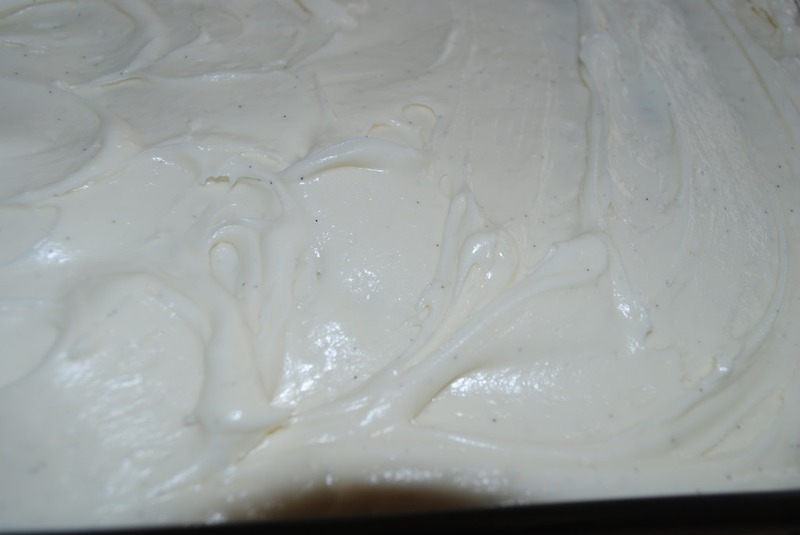 This cake can be made in a large mixing bowl. Combine flours, baking soda, baking powder, salt and cinnamon, set aside. Lightly beat eggs. Add sugar and oil. Add applesauce and vanilla. Fold in flour mixture. Add carrots, raisins and walnuts. Pour into 13×9 prepared pan. Bake at 350o for 45-50 minutes. Let cool completely before you frost. Cream together the butter and cream cheese. Add the marshmallow fluff and beat until well combined. Slowly add the powdered sugar a little at a time. Add the vanilla lastly. 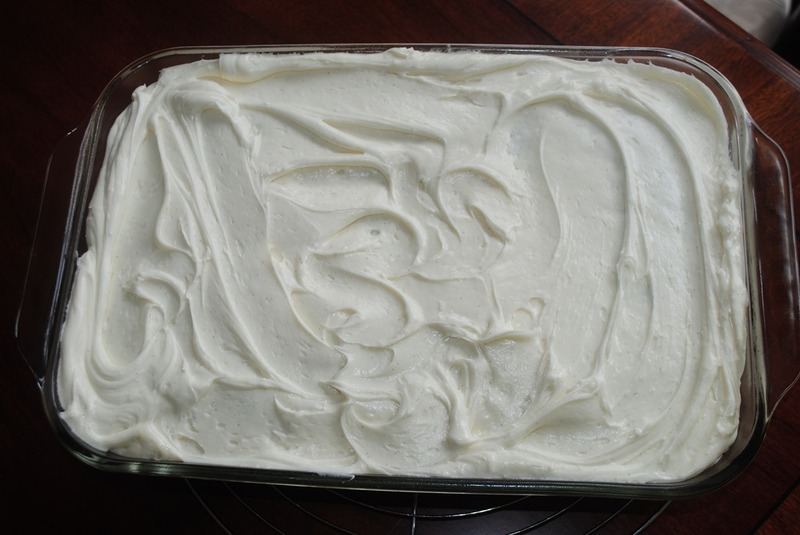 Smear all over your carrot cake once it has cooled. I really wanted to take a better picture, but my time was running out and I really wanted to get you guys a picture of the cake cut. It was really, really good.